Background: Twice in their history, Israel sinned against God by making and worshipping golden calves to represent YHWH. While Moses was 40 days on Mount Sinai receiving the 10 Commandments, Aaron led the people to melt their gold into an idol (Exodus 32:1-20). After Solomon fell into idolatry and died, God split the 12 tribes of Israel into two parts; the Northern 10 tribes (under Jeroboam) and the Southern tribes of Judah and Benjamin (under Rehoboam). Jeroboam didn’t want the people of the Northern 10 tribes to worship in God’s temple in Jerusalem, so he conveniently set up two golden calves unto YHWH, in the cities of Dan and Bethel, which were at the North and South ends of his kingdom (1 Kings 12:26-30). Aaron and Jeroboam both said, “These are the gods who brought you out of Egypt.” (Ex 32:4 and 1 Ki 12:28). Aaron and Jeroboam both instituted new worship festivals (Ex 32:5-6 and 1 Ki 12:32-33) as substitutes for God’s appointed festivals (Leviticus 23). 3. God severely judged their compromised, pagan worship. b. Golden Calves at Dan and Bethel: “Go, say to Jeroboam, ‘Thus says YHWH, God of Israel, “Because I exalted you from among the people and made you leader over My people Israel, and tore the kingdom away from the house of David and gave it to you—yet you have not been like My servant David, who kept My commandments and who followed Me with all his heart, to do only that which was right in My sight; you also have done more evil than all who were before you, and have gone and made for yourself other gods and molten images to provoke Me to anger, and have cast Me behind your back—therefore behold, I am bringing calamity on the house of Jeroboam, and will cut off from Jeroboam every male person, both bond and free in Israel, and I will make a clean sweep of the house of Jeroboam, as one sweeps away dung until it is all gone. “Anyone belonging to Jeroboam who dies in the city the dogs will eat. And he who dies in the field the birds of the heavens will eat; for YHWH has spoken ”’ “Now you, arise, go to your house. When your feet enter the city the child will die. “All Israel shall mourn for him and bury him, for he alone of Jeroboam’s family will come to the grave, because in him something good was found toward YHWH, God of Israel, in the house of Jeroboam. “Moreover, the LORD will raise up for Himself a king over Israel who will cut off the house of Jeroboam this day and from now on. Then Jeroboam’s wife arose and departed and came to Tirzah. As she was entering the threshold of the house, the child died. All Israel buried him and mourned for him, according to the word of the LORD which He spoke through His servant Ahijah the prophet. 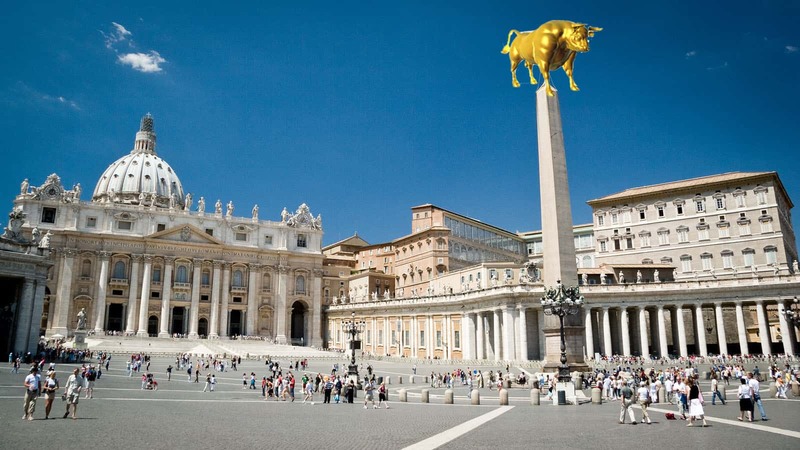 Golden Calves in Today’s Church? For centuries, Christian leaders have committed the sin of Jeroboam, promoting the worship of YHWH and His Son Jesus at Dan and Bethel—instead of in Jerusalem. How? The vast majority of ‘churches’ totally ignore God’s Sabbaths and the seven ‘appointed times’ in Leviticus 23, even though Jesus fulfilled four of these (Passover, Unleavened Bread, Firstfruits, Pentecost) and the remaining three (Trumpets, Atonement, Tabernacles) will be fulfilled in our future. Like Jeroboam, early church leaders wanted to keep their people away from Jerusalem (Hebrew roots of Christianity). So, as substitutes for YHWH’s prescribed ‘Jewish’ festivals, early church leaders invented alternative ‘christian’ festivals, i.e., Christmas, Ash Wednesday, Good Friday, Easter, etc. They claimed that all these festivals were to worship God, but none of them are in the Bible or recognized by YHWH. A quick google search will reveal their thoroughly-pagan roots. Trying to make these pagan holidays ‘Christian’ is like putting lipstick on a pig. The Greek word translated ‘lawlessness’ is anomia, which literally means “not law”. While Christian leaders say they believe the entire Bible is the inspired Word of God, by ignoring God’s appointed times in Leviticus 23 and substituting their own festivals, they are literally (even if it’s unintentional) practicing and teaching lawlessness—which is the rejection of God’s Word. The pattern is clear. Whenever Israel created their own way to worship YHWH, substituting their festivals for the ones YHWH specified, they fell into idolatry and sin, and then YHWH judged them severely. For centuries the church has ignored God’s Word, creating our own forms of worship and substituting our own festivals in place of the ones YHWH appointed for His people. The Apostle Paul tells us ‘the great apostasy’ will occur in the end time, associating it with the lawlessness of the Antichrist. Again, ignoring God’s Word concerning His appointed times is the Biblical definition of lawlessness. In 1 Peter 4:17 the Apostle Peter tells us the coming judgment will begin in the house of God. This judgment is reminiscent of Ezekiel 9:4-10, where God sent His angels to start the judgment in God’s sanctuary, with the church leaders. When the slaughter was completed, only the godly remained in the land. Respect God’s Word above man’s tradition, whether the tradition is Catholic, Protestant, Messianic, or Jewish. Obey God’s Word, according to the Holy Spirit’s leading. All Old Testament law, etc., must be understood in view of the cross. This perspective ensures you’re following God’s Word according to the New Covenant in Messiah’s blood, preventing you from falling into dead legalism. In our future, God will remove the lawless tares from His church, leaving His righteous disciples to shine as the sun. Which group will you be in?